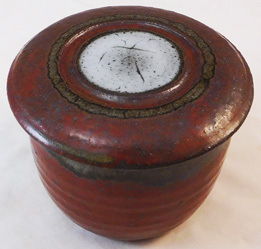 This high iron stoneware french butter dish has a dry mottled reddish brown glaze with white in the center of the lid and mossy green running into mottled red brown base. Only one available. 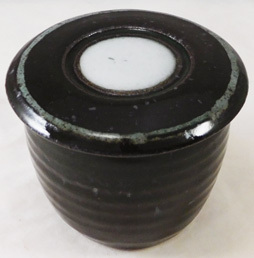 This stoneware french butter dish has a black glaze with white in the center of the lid. Only one available. 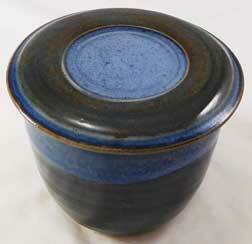 This stoneware french butter dish has a black glaze with blue in the center of the lid. Only one available. 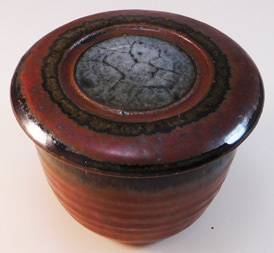 This high iron stoneware french butter dish has a mottled dry reddish brown glaze with blue under a white swirl in the center of the lid and mossy green running down from the top off the base. Only one available. 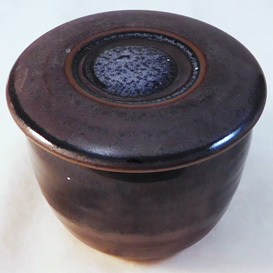 This stoneware french butter dish has a mottled brown and tan glaze with a blue swirl in the center of the lid. Only one available. 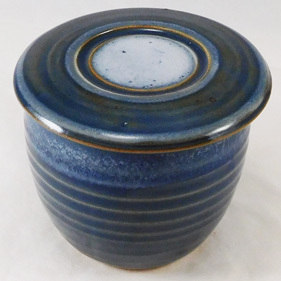 This stoneware french butter dish has a sea blue glaze with a blue/white swirl in the center of the lid and at the top of the base. Only one available. 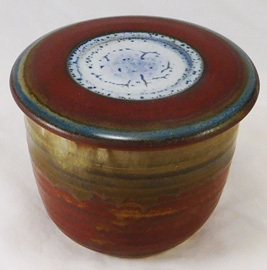 This porcelain clay french butter dish has a dark sea blue glaze with a white/blue swirl in the center of the lid. Only one available. 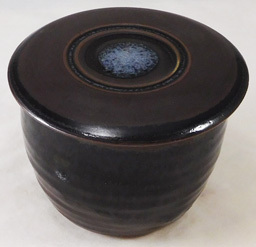 This stoneware french butter dish has a black glaze with a dark blue swirl in the center of the lid. Only one available.